Chattanooga is where we were at the end of April visiting Kirk's parents up in Signal Mountain. This was my first spring in TN and I have to say it was quite pleasant - I have been there in August and I thought the humidity was going to KILL me. And also in the winter when sheets of ice were coming down. In the springtime it reminds me of the NW - very green, a little rain and sun. I already told you about the amazing concert we went to so let me tell you about some of the other fun stuff to do there...be forewarned - this could impact your pocket book! Sundays - Go to the Chattanooga Market! From noon to 5pm - there are some of the best independent artists showing and selling their wares. 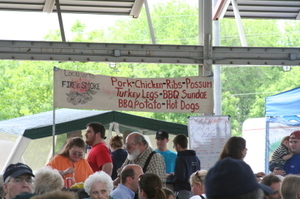 Plus if you have a craving for Possum there is a BBQ place for that and believe me the line was LONG! My first stop was at Bungo Glass, Shawn and Meghan do some of the most amazing boro glass pendants that I have seen. I bought one of the smallest ones I could find and some of his smaller beads to incorporate into my own jewelry. As I rounded the corner to another booth I spotted these handmade albums. The attention to detail and the craftsmanship could be seen from afar. 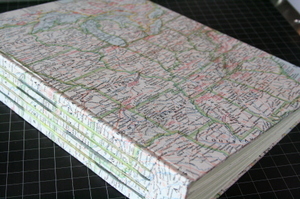 Of course the one with the US map on it caught my eye - maybe for all of my travel pictures?? Check out her site and download her catalog. 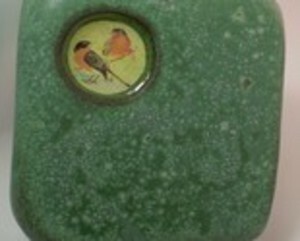 My next precious find was this small ceramic wall hanging - I had seen it in a gift store earlier in the week. So I took that as a sign plus having the opportunity to buy it right from the artist made it even more special. 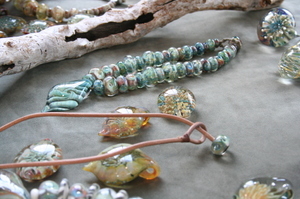 Denise Shropshire is the artist and her etsy store is here. And how about this skirt! I wish she had a website or sold on etsy but she is a one woman show - so the only place I know that she is selling is at this market. 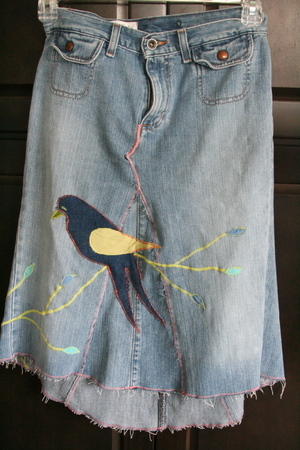 Her line is called Forget-Me-Knot handmade clothing and her name is Erin Burnap. I could not go home without this addition to my closet - not sure my stylist is going to like it but since I LOVE it she will make it work. My trip also included stops at the Knitting Mill Antiques and all the new renovated areas of downtown Chattanooga. Plus I was able to spend time with Bud Weiner - he is the sweetest boy! 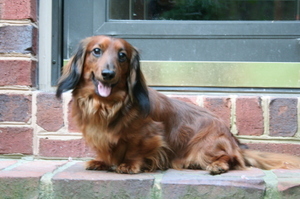 Yes, almost everyone in our family has dachshunds - it actually started with my in-laws.